Hailing from Brighton, Matt Finucane is a solo musician that seems to be determined to break the typical ‘singer-songwriter’ mould and says “I never pay lip-service to rock & roll clichés”. While his music is essentially a rock effort- the production element of his songs touches on other musical genres including indie and electronic. Although he plays solo, Matt Finucane manages to create a layered sound- his songs sound like they have had the benefit of a full backing band. 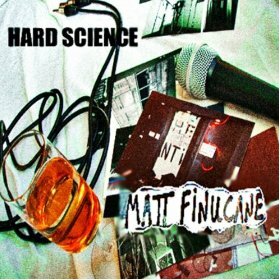 “Hard Science” veers on the moody side, with a slow melody, distorted hazy sounding guitars and a sense of distortion to be heard throughout. Finucane’s vocals have a modern rock sound- with touches of Thom Yorke and Matt Bellamy to be heard- Finucane stays in the lower register most of the time. “Hard Science” is joined by b-side track “Cast off Your Mask”. This song is a lighter attempt, with a more upbeat groove and a catchy guitar riff played throughout- while I don’t think I could quite interpret the meaning of the song, it retains matt Finucane’s low drawl and signature sound throughout. Matt Finucane will release his second album “Glow in The Dark” in July and 2012 and is set to begin touring following that release- check www.mattfinucane.net for details.